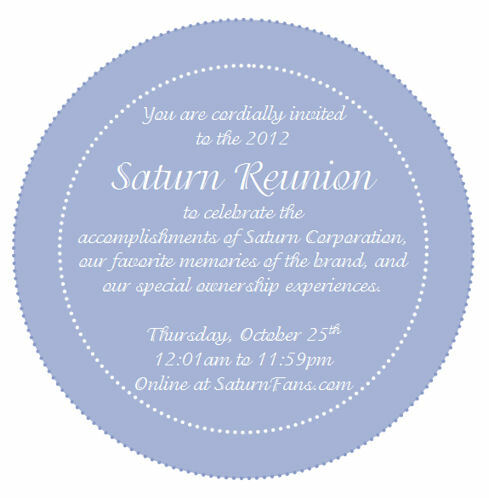 I hope to see everybody tonight just after midnight (EDT) for the start of the 2012 Saturn Reunion! But don't worry, if you can't join us until the morning, we'll have a log of all the posts cataloged right here on the front page of SaturnFans.com. The bulk of the activity will flow just like in the old days when there were Saturn news articles posted on an almost daily basis. OK, so there are only three more days until the 2012 Saturn Reunion hosted at SaturnFans.com. Let's see if I'm ready. Uploaded pictures of my current vehicle. Check. Update my user profile. Check. Post a message in the forums to reconnect with other members. Don't forget to upload recent pictures of your Saturn before the big event starts on Thursday. If you don't own a Saturn anymore, you can still share photos of your current ride by putting them into the "Not Quite Saturn" section of the SaturnFans.com Photo Gallery. If you are already logged in to the site, go ahead and jump right to the upload page. There's just five days before the start of the 2012 Saturn reunion. Are you ready? There's Just One Week Until the First-Ever Virtual Saturn Reunion! We're just one week away from SaturnFans.com's 2012 Saturn Reunion! We'll be spending 24 hours looking back at what made Saturn a different kind of car and company. From midnight on Thursday October 25th to 11:59pm of the same day, SaturnFans.com will take a trip back in time to when Saturn was building and selling some of the most innovative cars on the road. In just one month SaturnFans.com will be hosting the first-ever virtual Saturn Reunion and you're invited! Please join us as we pause for 24 hours to celebrate the accomplishments of Saturn Corporation, our favorite memories of the brand, and our special ownership experiences. The first Saturn was sold on October 25, 1990 and on that day next month Saturn fans from around the world will get back together - online - to reminisce, remember, and catch up on life after Saturn. SaturnFans.com is excited to announce dates for the first-ever virtual Saturn Reunion this fall: October 25, 2012. Mark your calendars! The first Saturn was sold on October 25, 1990 and later this year Saturn fans from around the world will get back together - online - to reminisce, remember, and catch up on life after Saturn. My brother, sisters, and I used to enjoy listening to "Rusty Chevrolet" on the radio every year at Christmas time when we were kids. It was a favorite of ours that became even more special to me with the creation of Saturn's rust-proof polymer bodyside panels. Sharing this song with my extended SaturnFans family feels especially appropriate this year – the first Christmas without Saturn. I hope you and yours have a wonderful day. Merry Christmas! There are currently 9 users and 301 guests online.